1) What is the current state of clinical data exchange between Electronic Health Record (EHR) systems primarily used for acute hospital care vs. ambulatory care? 2) Do leading EHR systems have useful “registry” capabilities? I have been hearing from many clinical leaders that the most popular EHR systems still do not support real clinical integration across settings, and are still weak in terms of the “population management” and clinical process improvement features that are present in existing chronic disease registry applications. I was hoping to learn that these concerns were really based on a lack on familiarity with how to configure and use EHR systems, rather than any inadequacies of the systems themselves. After all, clinical message and clinical document standards have been around for years, and population management features were prominently identified in recent Meaningful Use incentives. Some progress has been made in leading EHR systems, but clinical integration across settings and population management are still major weaknesses. It turns out that both problems are related to the same underlying issue: failure to appreciate the importance of “actively structured” information. Health Information Technology (HIT) leaders have for decades focused primarily on a vision of computerizing health information, going paperless, and improving the access to that information by many members of the clinical team across settings. To reduce the burden of capturing information that can be displayed on a computer screen, HIT vendors have developed document imaging, optical character recognition, and voice recognition technology. And, they have created clinical documentation systems that allow the user to enter simple codes to insert blocks of text into their notes quickly. 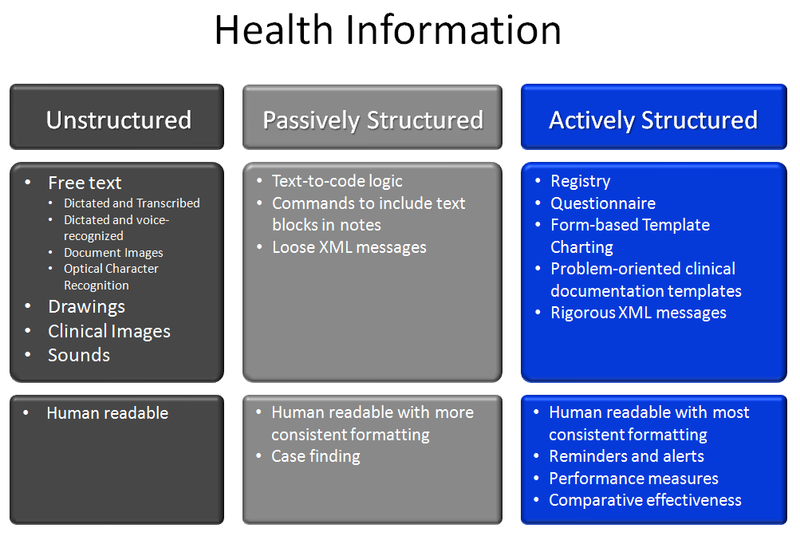 Over the last 15 years, most HIT leaders have recognized that there is some value in “structured data” — health information in the form of codes that computers can interpret rather than just display. In response to this recognition, EHR vendors have added “template charting” features that allow users to do exception editing of some coded values in notes. They have developed sophisticated systems to interpret the meaning of textual information and convert that text into structured data. And, they have created messaging standards that allow orders, clinical documents (notes) and continuity of care information to be shared across systems and care providers. But, the problem that remains is that the structured data that is being captured and exchanged is “passively structured.” Although the current crop of EHR systems may allow some of the health information to be represented with codes, the EHR tools and the care process itself do not assure the capture and transmission of particular pieces of information required to support particular down-stream uses of the data, such as reminders, alerts, quality and performance metrics, and comparative effectiveness studies. The clinical leaders that are focused on improving care processes, and the health services researchers that are trying to measure performance and comparative effectiveness are well aware that missing data is crippling to the usefulness of passively structured data. The real care process improvement and performance and effectiveness measurement efforts of Accountable Care Organizations requires “actively structured” health information. To assure the completeness of the information, they use “registry” applications, questionnaires, and data collection forms. And, they transmit this information in formats that rigorously enforce the meaning and completeness of the structured information. The objective is not to capture as much structured data as possible. The objective is to assure the accuracy and completeness of particular data elements that you are relying on for specific, strategically important purposes. I believe that HIT professionals may be reluctant to make actively structured information a requirement because (1) they lack expertise and familiarity with the downstream uses of the data for care process improvement and measurement, and (2) they are concerned that the added burden of actively structured data capture on end-user clinicians may further worsen their problems with “clinical adoption” of their technology. They are attracted to solutions that extract passively structured information from clinical notes, such as voice-recognition and “clinical language understanding” (CLU). And they don’t realize that the big pile of passively structured data output by such solutions will fail to meet the requirements of Accountable Care Organizations. 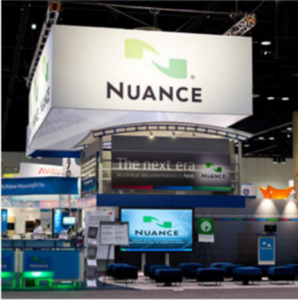 Refocus the design objectives of EHR products on the strategic goals of Accountable Care, rather than on the tactical goals of reducing medical records cost, “going paperless” or reducing security risks. The biggest implication of this will be the integration of analytic and care process management functionality into EHRs, rather than viewing those as separate solutions to different problems. Create stronger organizational linkages between HIT professionals, the clinical leaders involved in care process improvement and the epidemiologists and biostatisticians that have the expertise to measure provider performance and treatment effectiveness. Many hospitals, physician organizations and nascent ACOs are attempting to do this by hiring “chief medical informatics officers” (CMIOs). But that will only solve this problem if the new CMIOs can bridge between HIT, process improvement and measurement disciplines. If the CMIO role is viewed more narrowly as a liason between HIT professionals and front line clinician users, the focus will continue to be on unstructured or passively structured data to reduce barriers to HIT adoption. What is Business Process Automation (BPM) and Workflow Automation Technology? Workflow automation is defined by the Workflow Management Coalition as the “computerized facilitation or automation of a business process, in whole or in part.” Workflow systems generally provide a capability for entering metadata describing the sequence of tasks or activities in a work process, the resources required to execute each task, and the data needed to manage the flow of activities and to execute each task. Workflow systems also generally include a component that manages the execution of individual workflow instances, such as a workflow to process a particular insurance claim for an auto accident. This component is variously known as a “workflow engine,” a “workflow automation server,” or a “workflow enactment service.” This component tracks the status of each workflow instance, determines what task is needed next, determines what human or system resources to marshal to execute the task, and communicates with those resources to transport the needed data to and from the resources. In these systems, an instance of a workflow is generally initiated by completing a computer-based form that provides the data needed to get the workflow started. Workflow systems increase the efficiency of service delivery, since they are able to route the right task to the right person or machine at the right time. They increase the consistency and quality of service delivery, since they track work according to metadata that can define best practices. They also increase the reliability of services, since bottlenecks and errors can be identified and managed. Some workflow systems provide a generic framework that can be adapted to a wide variety of service-delivery processes. Business Process Management (BPM) is a management approach and a category of information technologies that supports this management approach. BPM includes the process-oriented management philosophy underlying Continuous Quality Improvement, Total Quality Management, Six Sigma, and Lean Thinking. It also refers to information technologies that combine workflow automation tools with additional capabilities related to simulation of business processes during the design process, specifying some aspects of the user interface offered to the end user, and capturing, analyzing and reporting process data. The vision of BPM technology is to offer “process transparency” and to support a management approach which emphasizes the ability for leaders and front-line participants in production processes to meaningfully participate in the design, re-design, and data-driven continuous improvement of their own business processing, rather than relying on technology experts to do that work on their behalf. The following figure from Wikipedia Commons illustrates the anatomy of a BPM platform. More information on BPM is available here. So, why can’t we just use off-the-shelf BPM technology for Patient Care? Despite the great promise of workflow automation and BPM technology in health care, there are a number of shortcomings to the generic “off-the-shelf” workflow and BPM systems that limit their health care utility. First, generic workflow and BPM systems lack tight integration between the process of developing a care plan and the process of care delivery. The form-based initiation for workflow instances employed by existing workflow and BPM systems works adequately for simple service-delivery processes such as an insurance claim, but is inadequate to use for planning of complex health care services where patients have multiple problems and needs that can only be met with a tailored collection of services. For example, existing medical order entry systems can handle the entry of a single laboratory, or even a set of orders commonly used for a particular purpose. But they are not up to the task of managing the creation of an overall plan of care for a patient with multiple health problems, particularly those that are being addressed by an inter-disciplinary team of health care service providers. And even for simple laboratory orders, existing order entry systems do not manage the entire process of communicating the results to the right people, escalating the communications process if people are unavailable, initiating follow-up services, etc. Another inadequacy is that off-the-shelf workflow and BPM systems require technical staff to write “scripts” (computer code) to create and edit workflow process specifications and to configure user interface elements. To a greater extent than in many other industries, the front line “workers” in health care are highly trained professionals with a strong sense of autonomy and a drive to innovate. Clinicians are attracted to evidence-based standards of care, but demand the ability to customize those standards to fit the local setting. Therefore, for workflow technology to work in health care, it must be supported by a prepared library of evidence-based workflow metadata, and by tools that facilitate the most common types of customizations directly by clinical staff. Finally, patients often have difficulty understanding their care plans and clinicians do not always have time to explain. Although some workflow-based CRM systems produce printed sales proposals with embedded explanatory material, this is not available in health care-focused system that solves the other problems described above. In health care and some other service industries, it is a legal requirement that service providers formally document the services that they provide, as well as their plans for delivering services in the future. Documentation of services provided is also a requirement for fee-for-service billing. Creating service plans and documenting services provided for legal or billing purposes represents a duplication of work. Although there are systems designed to assist in the creation of medical chart notes, no existing system integrates this clinical document function into a flexible workflow automation system to eliminate this duplication. Existing face-to-face processes for gathering input from multi-disciplinary teams of service providers into service plans is prohibitively expensive and logistically difficult for busy teams. For example, in the health care field, “tumor boards” and “inter-disciplinary clinics” are used to provide a mechanism for users in different disciplines and specialties to provide input and collaborate in the development of a plan of care for a patient. But the great expense of these meetings relegates this practice to only the most serious and academically interesting cases within advanced medical centers. Systems are not available to incorporate inter-disciplinary input into the development of a care plan that can be used for automatic initiation of workflows to manage execution of the plan.